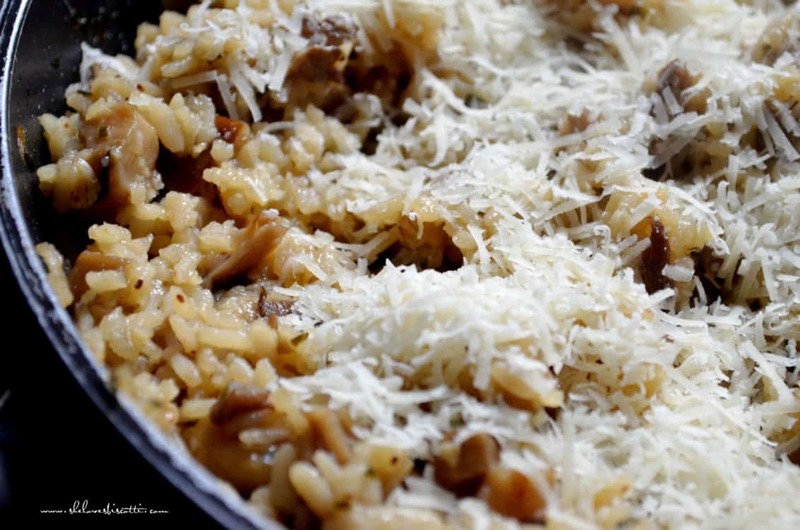 Home » Appetizers » Easy Mushroom Risotto Recipe with 5 tips! 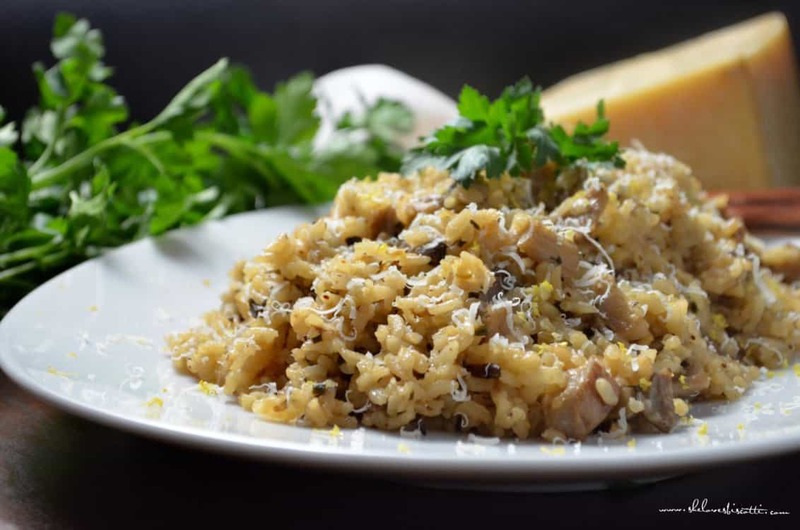 Easy Mushroom Risotto Recipe with 5 tips! This recipe for a Simple Basic Mushroom Risotto is a great place to begin your love-affair with risotto. Use the 5 tips as a bouncing board, and you’ll find yourself coming up with your very own risotto recipes in no time. 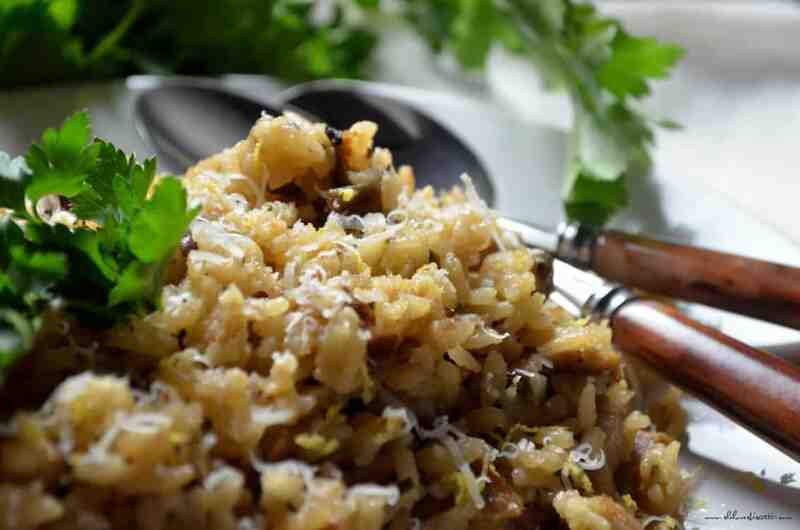 As you probably know, risotto is a traditional rice dish originating from Northern Italy. What was your first thought when you saw the word risotto? A basic risotto recipe can take about 40 minutes from start to finish. In my opinion, that’s a reasonable investment of time for the return you will get on the taste. Besides, if you have all of your ingredients measured and prepped, this simple risotto is really not complicated to throw it together. Tip#1: In order to achieve a silky creamy texture, you need to use a short grain rice. Arborio rice is a popular one. (If you recall, this is the rice I used to make Creamy Rice Pudding). Other kinds of rice that are appropriate include vialone nano and carnaroli. The short grain allows for a huge amount of liquid to be absorbed without the grain tasting like mush. Remember, risotto should always be cooked al dente. 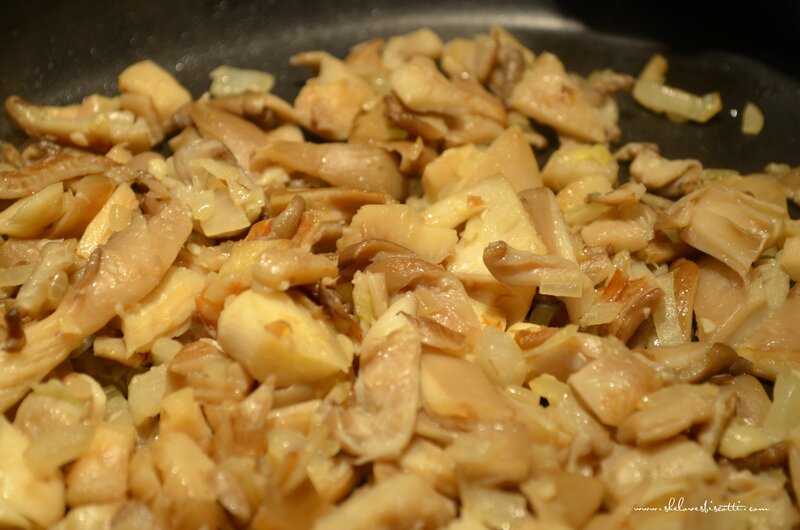 Tip#2: When making your soffritto, sauté your vegetables (in this case the onions and mushrooms) over medium-low heat until translucent. Tip#3: Toast the short grains for a few minutes in the oil before adding the liquids. This will enable each cup of uncooked rice to absorb up to 4 cups of hot broth. There are some recipes which will use butter as their source of fat; others will use a combination of oil and butter. I like using olive oil – it minimizes the amount of saturated fats in the recipe. As usual, feel free to experiment! Do what you like best. Tip#4: Add HOT broth to the rice. This allows for the rice to release its starch slowly, consequently allowing the rice to cook evenly. Tip#5: When the risotto reaches the perfect texture, remove it from heat, add Parmesan cheese and enjoy! As you can see, making risotto is really not difficult! A few years ago, I bought a magazine from Better Homes and Gardens called “Cook’s Secrets”. Just like my recipe for easy mashed potato cinnamon rolls, I’ve adapted this recipe from that magazine. 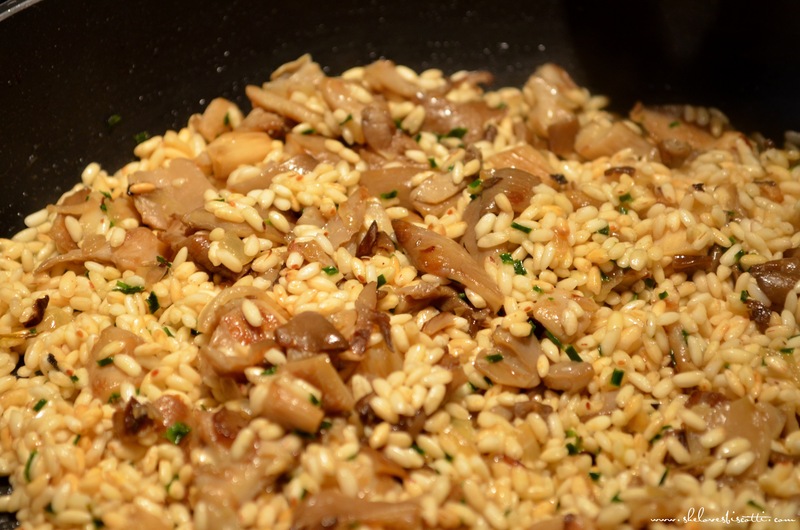 You now have a recipe for a the best mushroom risotto. Not only is it a great recipe in and of itself – once you master it, it’ll serve as a great base for a bunch of other risotto dishes, too! 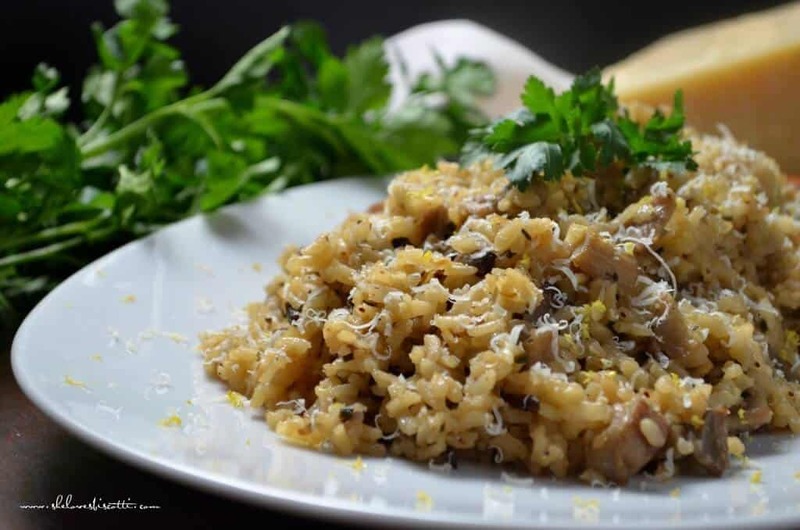 ★★★★★ If you have made this Easy Mushroom Risotto Recipe, I would love to hear about it in the comments below and be sure to rate the recipe! 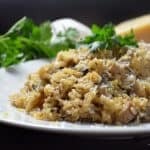 This recipe for an Easy Mushroom Risotto is a great place to begin your love-affair with risotto. Use the 5 simple tips as a bouncing board, and you'll find yourself coming up with your very own risotto recipes in no time. Place the broth in a medium saucepan and bring to a low simmer.Keep warm. Drizzle 1 tablespoon olive oil in a heavy, very large skillet,over medium-high heat. Transfer mushrooms to bowl and set aside. Drizzle 1 tablespoon olive oil in the same large skillet,over medium-low heat. Saute the onions, and garlic for about 5-7 minutes until translucent. Stir frequently. Add the rice. Increase heat to medium. Keep stirring rice and onions (frequently) for about 4- 5 minutes. The edges of the rice should begin to turn translucent and just beginning to turn a light golden brown. Add the wine (or broth) and stir constantly until absorbed. This should take 30-60 seconds. Stir in 1/2 cup of hot broth into the rice mixture. Keep stirring until the broth is absorbed. Keep adding the broth (1/2 cup at a time) until it is absorbed, stirring all the while. Halfway through this procedure (about 8-10 minutes of adding broth and stirring) add the sauteed mushrooms. Keep adding and stirring 1/2 cup of broth at a time. At the end of 16-20 minutes, start tasting your risotto. The texture should be al dente but still creamy. Remove from heat and stir in the cheese. Serve immediately with additional parmesan (if desired). The versatility of this recipe really allows you to use whatever mushrooms you have on hand. I used what I had on hand, a combination of white, crimini and oyster mushrooms. I also used minute rice 😳 since I was out arborio. This is one of those dishes that’s absolutely worth the investment of time. I love risotto and the myriad of variations you can make. Thanks for the reminder that I must make this soon.